What you see above is but a small portion of a 8-Bit map of New York. 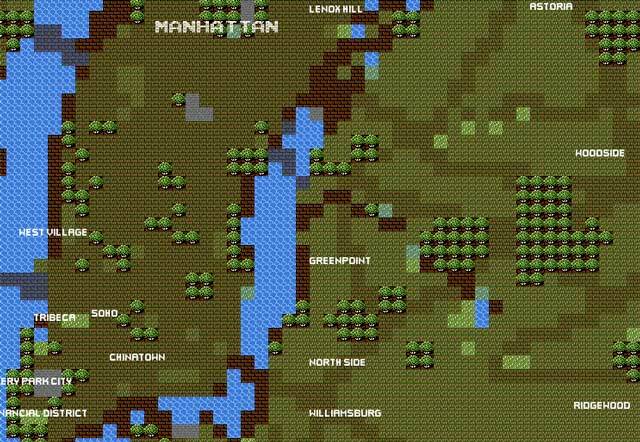 It’s called 8-Bit NYC and it’s really a neat piece of work. It combines gaming in the 80s with the real world of today. You can enter addresses, find directions, and the map works in every bit of detail as a regular road map or GPS. Really neat no? It takes me back, specifically to The Adventure of Link which carried a more top down map view. It also resembles other titles, such as Dragon Warrior and Final Fantasy. It’s a great work of art and surprisingly useful. You can find out more at 8-Bit NYC.